There was a time when buying a power trowel was a yes or no question. Manufacturers offered one type in different sizes and that was it. Over time there were different engine options, but not much else to cater to the contractors using them. The 90’s brought on more changes in weight and pitch adjustment, and contractors now had some choices. Many users developed brand loyalty based on their favorites, and held true to them over the years. CONTRACTORS TODAY HAVE MORE OPTIONS THAN EVER TO CHOOSE FROM. Here we are now in 2015 and the trowel market has become inundated with manufacturers, importers and options; almost like the pickup truck market has. In the past, you were either a Ford or Chevy guy. Now you have a multitude of brands and options in both imports and domestics. Just as the truck market was forced to innovate and change, many trowel manufacturers have as well. Contractors today have more options than ever to choose from, and Bartell (like Ford or Chevy) has adapted and grown since their original 36” trowel in 1962. Our walk behind line up has grown from one single unit to eight; with engine, gear box, clutch and handle options to give the operator a total of forty four (44) different models. Why, you ask? If the Ford dealer told you they only had six cylinder models and you needed more power, would you buy a Ford? If you only needed a mid-size pick up would you buy an F450? Probably not on both counts and that’s why you have so many options with Bartell. For starters, we offer both a Commercial series and a Professional series. If you trowel every day you’ll want our Pro (B) series. 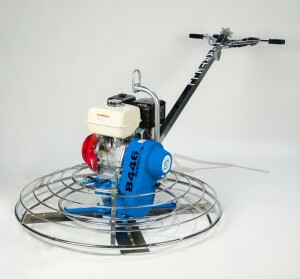 The B446 uses the gear box from our six foot riders. It’s completely over built for a walk, but that’s why we have units in the field over 40 years old, still on the original gear box. If you’re a general contractor and don’t pour concrete every day, the Pro series is overkill. The commercial series is a great alternative; saving you almost 20% on your initial purchase. If you drive your truck every day, you want it loaded. If it’s a second vehicle, you probably won’t put as much in to it. We offer the longest warranty in the business on our Pro Series (3 years), while our commercial series trowels match the industry standard of one year. When it does come to price, our Commercial series is great for the contractor that needs a quality product with a quality company that will back it up. With the 3-year gearbox warranty on our Professional series, you know that you’re getting the best money can buy. At the end of the day, you can’t go wrong with either trowel. Both are high-quality machines that produce excellent results. And while it’s easy for us to sit and talk about why our machines are supreme, we believe the results speak for themselves. Commercial series or Professional series, it doesn’t matter; you’re going to love a Bartell Trowel.